Subjective well-being (SWB) is an emerging research topic in the field of design sciences, whereby various design researchers focus on the key question ‘how to design for SWB’. Throughout different design disciplines, definitions for SWB are rising and design models and strategies are being developed in an effort to enable designers to increase users’ SWB. However, a clear image of how to design an (interior) architectural environment with the purpose of increasing people’s level of subjective well-being is still in its infancy. 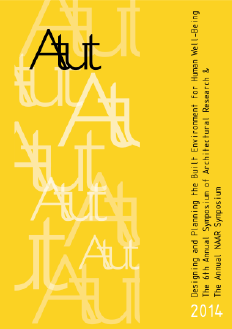 In this paper we formulate spatial design missions for (interior) architects that possibly ignite or increase users’ SWB. We start from the general PERMA happiness model of Seligman (2011), modify it to our research needs and illustrate it with material from a design exercise that was carried out by master students in interior architecture in which they had to rethink the communal space system of an existing residential care center. We conclude the paper by formulating seven design missions that, in our viewpoint, allow to augment SWB for elderly persons in residential care environments.